Deterrence can work in several ways. Often it’s hoped that the very existence of a severe punishment will serve as a deterrent to offense — that, for example, a death penalty on the books will dissuade people from committing murder. either it’s hoped that meting out punishment to an offender will serve as a deterrent to further offense: as we say, this is to teach you a lesson; let this be a lesson to you. or it’s hoped that a punishment will serve as a deterrent to others: as we say, we’ll make an example of you. idiom make an example of: to punish (a person who has done something wrong) as a way of warning other people not to do the same thing – Although it was only his first offense, the judge decided to make an example of him and sentence him to prison. The Battle of Minorca (20 May 1756) was a naval battle between French and British fleets. It was the opening sea battle of the Seven Years’ War in the European theatre. Shortly after the war began British and French squadrons met off the Mediterranean island of Minorca. The French won the battle. The subsequent decision by the British to withdraw to Gibraltar handed France a strategic victory and led directly to the Fall of Minorca. 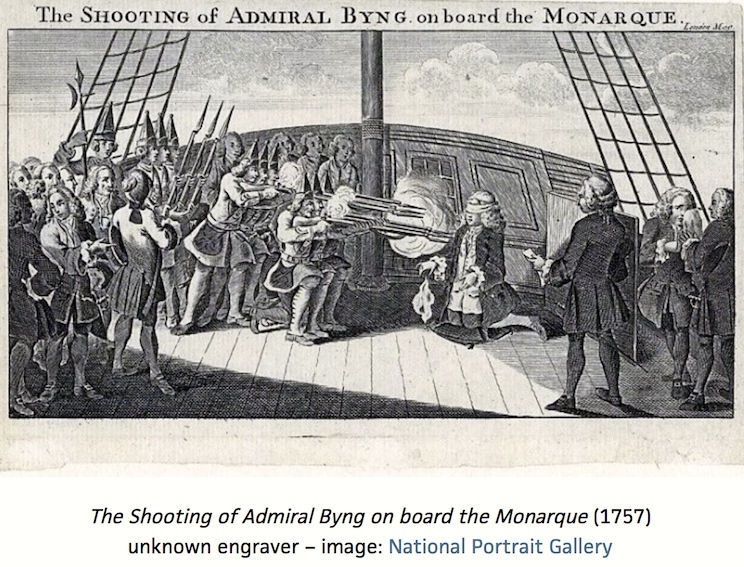 The British failure to save Minorca led to the controversial court-martial and execution of the British commander, Admiral John Byng, for “failure to do his utmost” to relieve the siege of the British garrison on Minorca. … Byng’s execution is referred to in Voltaire’s novel Candide with the line [above]. I’ve long been fond of the pointedly ironic pour encourager les autres — or its English version to encourage the others, I don’t insist on the affectation of quoting in French– especially if delivered in creaky voice or some other notable vocal quality. This entry was posted on June 26, 2018 at 4:39 pm and is filed under Idioms, Quotations, Sarcasm and irony. You can follow any responses to this entry through the RSS 2.0 feed. You can leave a response, or trackback from your own site.